If you want the ultimate in silk comforter opulence, this Kumi Kookoon comforter is about as good as it gets. Covered in 19 momme mulberry silk charmeuse and filled with hand-pulled Grade "A" raw mulberry silk these hypoallergenic fibers naturally adhere to one another, light enough for the summer, yet warm enough for the winter. 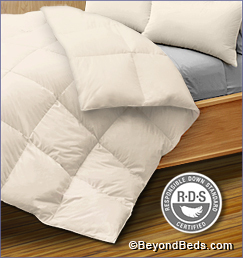 Special loops coordinate with our Kumi Kookoon duvet covers to keep your comforter neat and in place.